Tony Knight. Photo by Randy Wakeman. 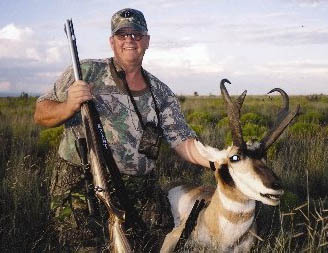 Perhaps no person is more synonymous with the sport of muzzleloading as it exists today, and I can think of no other person who has brought more people into the sport, and worked as long and as tirelessly to promote it as has Tony Knight. I’m delighted that Mr. Knight consented to visit with us about himself and his favorite sport, inline muzzleloading. TK: Well, after seventeen years with the railroads, then running my own little archery and gun shop in northern Missouri, a group of my farmer friends started the ball rolling back around 1982. They loved to hunt, but there were few hunts that did not conflict with the farm work. The Colorado muzzleloading elk season was one they could participate in without clashing with getting the crops out, so that was the subject matter. They tried it with relatively common frontloaders of that time, with horribly frustrating results. So, they wanted more reliability and accuracy than available at the time. We went to work, and the culmination of those efforts became what is now known as the Knight MK-85, named after my daughter, Michelle. Things moved along from there, and instead of working out of my shop building muzzleloaders one at a time, we opened our factory in Lancaster, Missouri, in 1987. We desperately needed to expand after about 1-1/2 years due to growth, and we looked for some assistance from the State of Missouri. Missouri was less than helpful; most everything that Missouri said "no" to, Iowa said yes to. So, we expanded with our new plant located in Centerville, Iowa, and we have been there ever since. TK: Yes, actually it was Roy Weatherby that was a source of encouragement when a lot of the others were nay-sayers. Roy Weatherby told me all the details of how he started, what his challenges were, and shared with me what he felt his successes were due to. Roy helped me along the right path when others couldn’t be bothered, and I’m indebted to him for that. TK: Without doubt it is a bolt action based on fit, feel, function, trigger, accuracy, and everything. TK: I sure do, it is the .52 caliber. I’ve found it to be far more forgiving than other calibers. As far as downrange terminal performance, the results I’ve has have been nothing short of astonishing. In fact, some of the game animals hit the dirt so fast on video it looks fake; just too good to be true. It is true, however: the .52 performs like nothing else. TK: There are several scopes that I like, Burris and Leupold among them. My very favorite scope at the moment is without question the Kahles Multi-Zero,there is just nothing like it. Once you’ve got it dialed in, it takes bullet drop right out of the equation. Just dial in your range, and put the cross-hairs on the animal. It is an amazing achievement in riflescopes. TK: Once you get to a certain level, they are just all good. Zeiss, Leica, Kahles, Swarovski—they are all superior hunting tools that not only enable good locating and judging of game, they don’t leave you with a headache after glassing for several hours. TK: I like the fact that muzzleloading is more convenient and muzzleloaders are easier to clean than ever before. What I don’t like is much the same, we can still make muzzleloading more fun, convenient, and easier to enjoy. And, we are working on it. TK: Growth, growth, and more growth. Every year, more folks enjoy the sport of muzzleloading with no end in sight. It is a great way to introduce youngsters to shooting sports, and to readily understand how firearms work. Limited range weapons have greater and greater appeal as human populations and game populations move closer and closer together; game populations that will always need to be controlled. The sport of muzzleloading looks to continue to grow vibrantly for the foreseeable future, and I’m quite excited about that. It was a pleasure visiting with Tony; his enthusiasm and passion for muzzleloading and for hunting is apparent. It sounds like Tony Knight has a lot of hunting adventures ahead of him, and that he’s ready to go today. With that, let’s leave for the moment with thanks to Tony Knight for taking the time to talk with us. And even more so, appreciation for Tony Knight’s tremendous, ongoing contributions to the great American sport of muzzleloading.